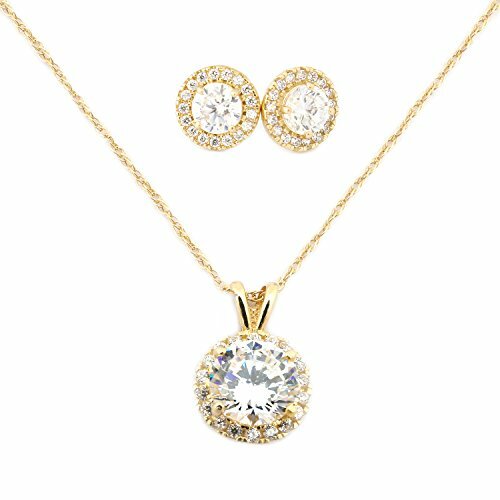 This necklace and earrings are made of solid 14k gold, featuring the quality cubic zirconia stones. Our cubic zirconia is bright and clear with an unmatched sparkle, so it'll easily convince others it's the real thing. The necklace is a delicate and feminine rope chain with a spring ring clasp. The pendant measures 9mm (0.35 in) x 9mm (0.35 in) and weighs 0.9g. The chain measures 0.8mm thick and weighs approximately 0.6g. The necklace comes in 15", 16", 18", 20" and 22" lengths. The earrings measure 7.7mm (0.3 in), and the center stone measures 4.5mm (0.18 in). Unsure what length chain to buy? 18" is the standard length and will look great on most people. 13" length is recommended only for small children. The 15" length is great for small children as well, but it can also be worn as a choker on an average size adult. The 16" length will fall just above the collarbone on an average sized adult woman, while the 18" chain will fall just below it. For best results, we do recommend using a tape measure to check neck size before placing your order. This necklace and earrings are made of solid 14k gold, featuring the quality cubic zirconia stones. Our cubic zirconia is bright and clear with an unmatched sparkle, so it'll easily convince others it's the real thing. The necklace is a delicate and feminine rope chain with a spring ring clasp. The pendant measures 9mm (0.35 in) x 9mm (0.35 in) and weighs 0.9g. The chain measures 0.8mm thick and weighs approximately 0.6g. The necklace comes in 15in, 16in, 18in, 20in and 22in lengths. The earrings measure 7.7mm (0.3 in), and the center stone measures 4.5mm (0.18 in). If you have any questions about this product by Beauniq, contact us by completing and submitting the form below. If you are looking for a specif part number, please include it with your message.